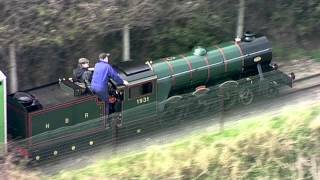 The best way to see the beauty of the River Severn is from a steam hailed train on the Severn valley Railway between Bridgnorth and Kidderminster. Resfreshments are available at stations and on most tyrains. Luncheon trains run every Sunday. Special events include visits by Thomas the Tank Engine and Santa. Other themed events include the 1940a weekends and Classic Car and Bike Day. Open: 8 May - 26 Sept and Local School Holidays, every weekend and daily. Have you been to Severn Valley Railway? Please rate this attraction to assist others. How many thumbs for Severn Valley Railway?